We have been enjoying the sun this week getting grubby playing in the garden and we had a picnic at Little 1's school in aid for the Queen's birthday which was lovely with hundreds of people sat in red, white and blue on the grass. This weekend the girls loved washing Daddy's car in their swim suits while Little 3 looked on from the pushchair. Emma hosted last week and says..
'The Trainee Mum linked up her 5 top tips for staying cool when pregnant in the summer, which I think will be a great help. 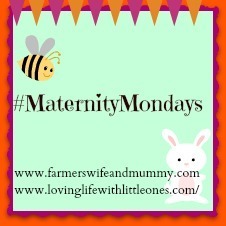 As usual #MaternityMondays is for all your pregnancy, baby, toddler and maternity themed posts, please grab our new badge from my sidebar and comment on the hosts post and as many of the others as you can as linkys can only work if we support each other. If you tweet about the link up please tag me in @lifelittleones and use the hashtag #MaternityMondays and I'll retweet as many as I can.